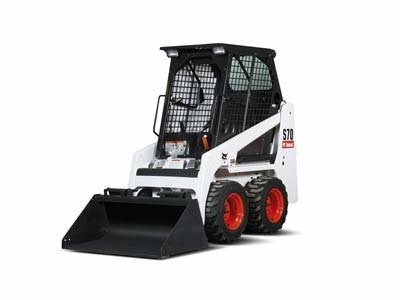 There is nothing mini about the amount of work the Bobcat® 44" S70 Skid-Steer Loader can do. This compact loader is small enough to get in tight spots, yet tough enough to get you out. This agile little workhorse is only six feet tall and three feet wide - the ideal size for scooting through narrow doorways, corridors, aisles, alleys, gates and for working under low ceilings. It's the perfect loader whenever the job is too big for a shovel or the space is too small for a larger machine. The S70 is perfect for backyards, barns, construction sites and demolition areas. Not to mention, with more than 20 Bobcat® attachments to choose from, the Bobcat® Mini 44" S70 is a multi-attachment carrier that's ready to take on just about any job. Length with Standard Bucket: 100.5"
Height to Bucket Pin: 94.5"